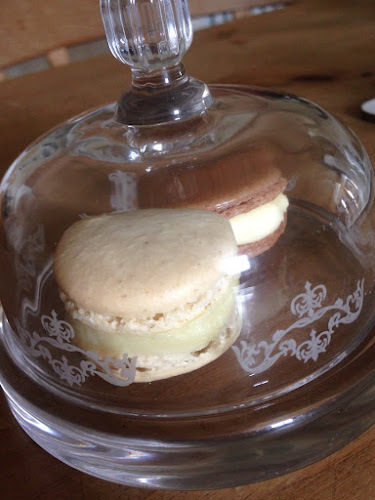 The macaron adventures continue, this time re-visiting some flavours used in a one day class I attended back in January at Bertinet's Cookery School in Bath. There were two flavours I wanted to try, fennel and white chocolate and orange and cinnamon. Below you can see all the elements of the orange and cinnamon ones being brought together. 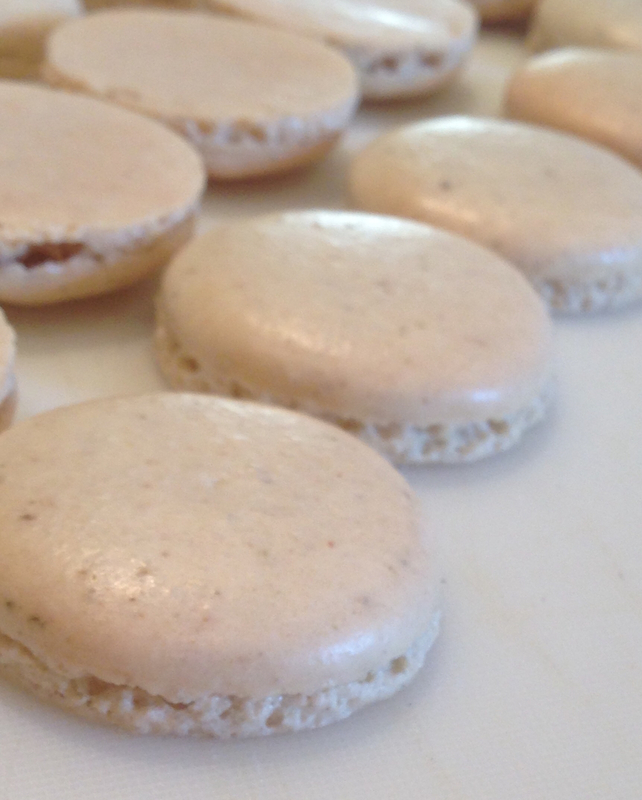 The macaron shells follow the basic french meringue recipe but with ground cinnamon added for flavour and colour. This was not very successful. These shells took double the cooking time, had splatty feet and once cooled, dipped in the centre top of the shell. I haven't had this happen before and can only assume it was the addition of cinnamon to the shell mix. In future I'll add the cinnamon to the piping mixture which was a sugar and cream cheese mix. 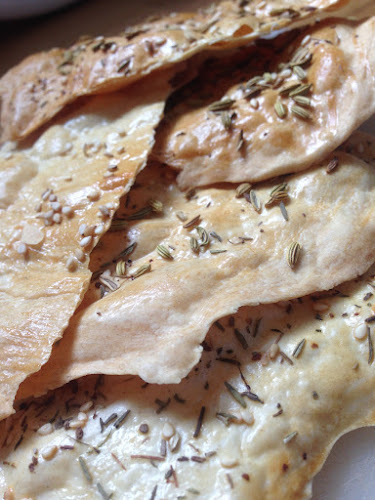 (Sorry I can't share the exact recipe because it's copyrighted.) The orange disc is made from freshly squeezed orange juice and 3 gelatin leaves. 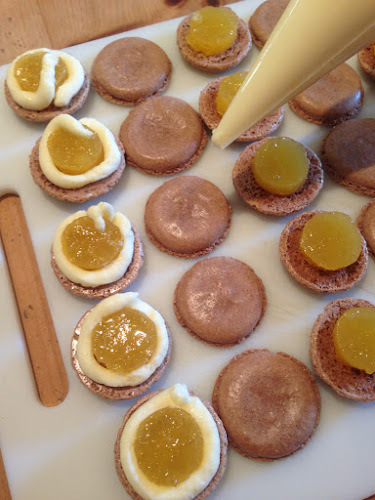 You pour this into a thin layer in a tray and once set, use a small circle cookie cutter to cut out discs to use as the filling. This was very good and a borderline genius idea I can imagine adapting to other flavours! But again, I got it wrong by using a dish which wasn't shallow enough. You can see how tall they are here. 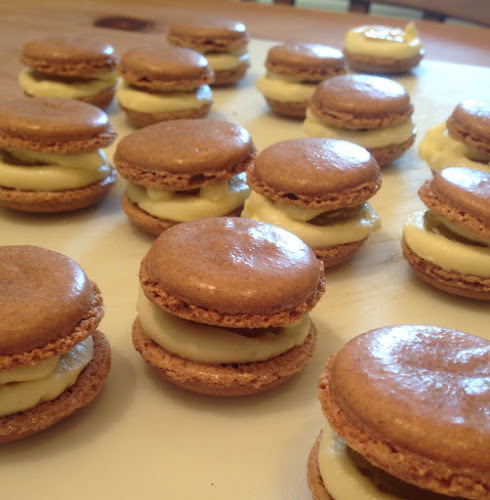 They look quite comical and I learned a LOT by re-doing these recipes. The shell texture was a bit chewy (due to the longer cook time and cinnamon I think) but the flavour was all there. We got into a bit of a mess eating these! By contrast the batch of fennel and white choc was far more successful. So for the shells, you dry roast some fennel seeds, grind to a fine powder and add to the meringue mix. These cooked beautifully with lovely risen feet and just the right crispness. I was very happy with them and once they were filled with caramelised fennel sieved while still warm over grated white chocolate, they were sublime. I think this has to be one of the best tasting macaron flavours I've found. They were so good we nearly ate them all before I remembered to take the pic at the top of this post of the two flavours under a domed glass ummm....dome.